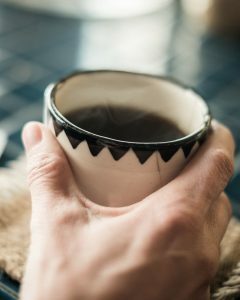 Home » Health » How Does Caffeine Affect Our Bodies? The mornings are hard for some, and getting up can be even harder. We all have turned towards a morning boost through caffeinated drinks, such as coffee, soda, energy drinks, etc. Doing this constantly over a period of time can have some health risks, and I wanted to talk about some great alternatives. I will also talk about the health risks and how to know if you’re drinking too much of any type of caffeine product. Caffeine is a central nervous system stimulate, which means It works by stimulating the brain and central nervous system, helping you to stay alert and preventing the onset of tiredness. About 80% of the world drinks some type of caffeinated drink each day. Caffeine consumption has a chance to raise your blood pressure. A study done showed that 2 cups of coffee was able to raise the blood pressure level of patients for anywhere from 2-3 hours. Caffeine is also linked to gout flare-ups. There is a higher increase of heart attack among young adults, according to a study by Dr. Lucio Mos, a cardiologist at Hospital of San Daniele del Friuli in Udine, Italy. Her study showed that anyone who consumed the amount of caffeine that is equivalent to 3 to 4 cups of coffee is at risk. There are many drinks, other than coffee, that contain caffeine. Caffeinated beverages besides coffee include tea, soda, energy drinks, chocolate, and frozen treats/dairy products – all of which contain varying levels of caffeine. So how do you know what amount of each drink is okay to consume? Most coffee drinks have anywhere from 0-500 mg of caffeine. Teas, iced or hot, can have anywhere from 0-100 mg of caffeine. A list of soft drinks shows that there is anywhere from 0-120 mg of caffeine. Energy drinks have a higher amount per drink than normal drinks and can range anywhere from 0-500 mg of caffeine. Be sure to check the label of everyday drinks to check caffeine servings. Up to 400 milligrams (mg) of caffeine a day appears to be safe for most healthy adults. A detailed list of caffeine servings in drinks can be found here. There are plenty of healthier caffeine alternatives if that’s what you’re looking for. Tea and coconut water are two of them. This next one might turn a few heads but wheat grass. According to DR.Gloria Gilbere, “because of its easy digestibility and rapid assimilation, it’s a natural energy supplement, whether alone or added to a protein-type supplement drink.” Lemon water has been seen to give a similar boost of energy. Likewise, pomegranate juice is known for its energy boosting properties and can easily be incorporated into many recipes. For a greater list of caffeine alternatives, visit Shape.com.